Let me tell you a story from my childhood. Once upon a time there was a young girl who liked to play with Barbies. She even had a house to keep them in. Instead of imagining what they’d say to each other and dressing them up all day, she would carefully arranged all the furniture, set the Barbies in the scene, and leave everything alone in perfect order. When her friends came to play, she’d reluctantly let them disturb the intricately-arranged exercise bike room, and so forth. Sigh. It’s pretty obvious from this story that from an early age that I liked having things orderly and resolved into a perfect arrangement. As I got older, I found that I was constantly rearranging my own furniture and finding better ways to store all the things I collected into my space (as the lucky oldest and only girl, I had my own room to fiddle with). Eventually, my preoccupation with organizing space also filtered down into my organizing time. I started to keep a daily planner since the age of 14. This served me well in high school and college, when managing my time effectively was part of the toolbox that made enough space for me to complete degrees in English and Studio Art in four years. So I’ve always been the organized sort. I can’t help it. Completing things according to a schedule, and having a place for everything has been a part of creating a sense of ease. It’s been a way for me to deal with anxiety, to cope with heavy loads, and to manage complex projects simultaneously. It pleases my clients, helps me keep my promises, and allows me to work in a sustainably creative way. But in the midst of all this order, I’ve learned that a certain amount of mess is desirable, and even needed. The other day, while cleaning my studio floor, I started picking up little bits of fluff off the floor and finding inspiration in them — I keep a collection of threads, flotsam, and jetsam in a pile on my work table. Most of the time it sits untouched, and it tends to grow a little every few days. Then, occasionally, I find I need something out of it. Other times, I throw out the pile and start again. Tidying up the mess around me is becoming a way of finding new materials to work with. (It's also a great place to start if you're feeling stuck.) If there wasn’t a mess in the first place, or if I wrote it off as something not worth giving attention to, I might have missed something. I even have a drawer that I fill with my children’s drawings and tiny gifts that have struck me as something interesting—I’ve labeled it “Kidspiration.” Some of my most interesting ideas & materials have come from noodling around in that drawer. Similarly, I’ve slowly come to learn that scheduling every last minute of my day for maximum efficiency (you could call it “being tidy with my time”) isn’t the way to let the creativity flow. Yes, it’s true that everyone needs a rhythm of work (which is the first item on my artists manifesto)—to show up every day for your work like a professional, whatever that means for your medium or specialty. However, that rhythm of work has to include time to do nothing. You see, if I don’t create space around all my activities for nothing to happen, I don’t get to explore something new and serendipitous that comes across my path. With empty space in between, I can be flexible for creativity, an emergency, or rest, if I need it I call this “buffer time,” while others call it “white space.” You could also call it “empty time to make a mess of something.” (See also: Why you need “white space” in your routine.) Most of the time I use this empty temporal space to be with & manage my children—both caring for them and being inspired by them. And speaking of children—they’ve been a large part of the reason I stay reasonably tidy in the studio. I picked up the habit of putting things up and out of the way in the early phases of motherhood, because toddlers will grab at anything that’s left out. This means that these days I struggle with keeping things too tidy and too perfect. Since my studio is a multipurpose space, my 8-year-old still fiddles with whatever interesting scrap he sees on my work table (even though I feel like I’ve told the kids eleventy-billion times to ask before touching things). It takes intentionality to leave just enough mess. Without a mess, there’s not much for me to work with when my time becomes available. Likewise, caring for children means I feel the time pressure to squeeze as much “productivity” as I can into my day. It feels luxurious and wasteful to leave white space (as a mother), but it is an absolute necessity for me to create the work. Creating white space in my time allows me to see new connections and explore them. Without the mess and the empty time, I wouldn’t be able to find my way to new work. What about you? 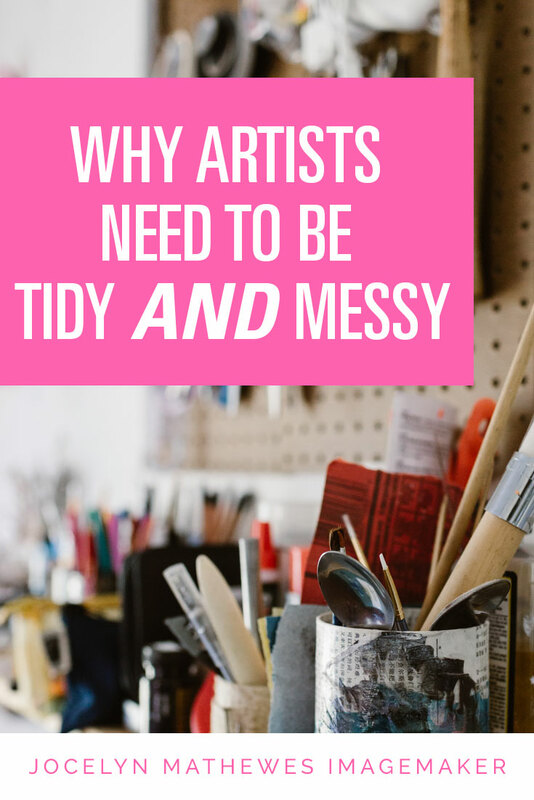 Are you particularly messy in your workspace, or do you like to keep things orderly?